State Councilor and Foreign Minister Wang Yi will pay an official visit to Japan upon invitation from April 15 to 17 and co-chair the 4th China-Japan High-Level Economic Dialogue with Japanese Foreign Minister Taro Kono. State Councilor and Foreign Minister Wang Yi's this official visit to Japan makes an important move for the two countries to step up high-level exchange and communication. We hope this visit will strengthen mutual trust, build consensus and manage differences between the two sides, thus further consolidating the momentum of improving China-Japan relations. 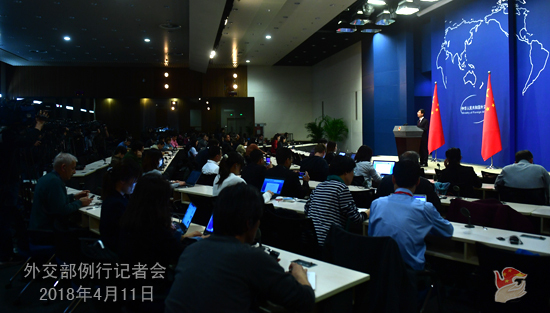 Q: President Xi Jinping's speech on expanding opening-up at yesterday's opening ceremony of the Boao Forum for Asia annual conference has drawn great attention worldwide. Some foreign media said that China quite coincidentally plans measures in areas where the US has previously expressed its concerns, such as automobile and intellectual property right. Can you confirm that such opening-up measures China plans to take are related to the trade friction with the US? A: I can assure you unequivocally that these major measures we will take have nothing to do with the trade friction we are having with the US. Anyone who has some knowledge of how the Chinese government operates will understand that the rollout of such an important decision involving all these major measures will take some time to formulate, deliberate, and improve until everything is ready. It is impossible to make such a decision at short notice. You may recall that we keep stressing that China will continue to adhere to its fundamental national policy of opening-up and pursue development with its door wide open. China's door of opening-up will not be closed and will only open even wider! This is our consistent position. Last year's 19th CPC National Congress report and this year's government work report drew up guidance and plans for our opening-up efforts going forward. Yesterday's announcement of these measures is a solid step to implement the aforementioned two reports. It was made in line with our own needs, timetable and roadmap. China is determined to open wider to the outside world, no matter what others do. Q: According to reports, Song Tao, who serves as head of the International Department of the Central Committee of the Communist Party of China (CPC) will visit the DPRK on Friday. Could you provide more information? A: According to my information, the International Department of the CPC Central Committee has already released relevant information. At the invitation of the International Department of the Central Committee of the Workers' Party of Korea (WPK), Song Tao, Director of the International Department of the CPC Central Committee, will lead a Chinese art troupe to the DPRK to attend the April Spring Friendship Art Festival on April 13. The April Spring Friendship Art Festival is an international event hosted by the DPRK to promote cultural exchanges. China sent art troupes to the previous festivals upon invitation. This time, our attendance at the festival, which comes on the heels of a historic summit between General Secretary Xi Jinping and Chairman Kim Jong-un, is meant to implement the important consensus reached between the two leaders of the parties and the countries on deepening cultural exchanges. We believe that this visit will contribute to strengthening China-DPRK friendship and promoting cultural exchanges between the two sides. Q: The UN Security Council failed to adopt three draft resolutions on the issue of chemical weapons in Syria on April 11. What's your comment? A: China's representative has stated its position and proposition in a comprehensive and clear way when the Security Council took actions regarding relevant draft resolutions. 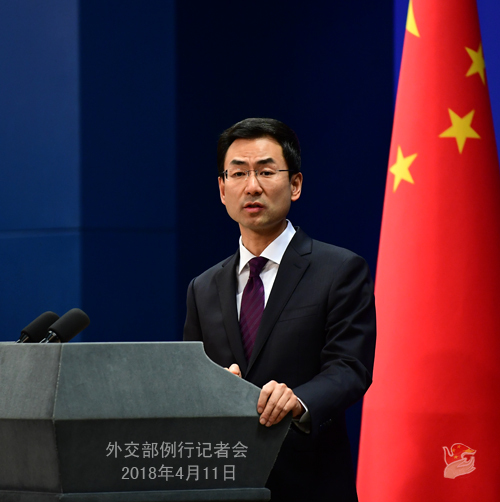 China firmly opposes the use of chemical weapons under whatever circumstances and for whatever purposes by any country, organization or individual. China all along maintains that the Security Council should engage in negotiation with patience to build consensus and send out a message of solidarity. We are regretful that it failed to reach consensus on the issue of chemical weapons in Syria and concerned over the latest development of the situation there. China calls on relevant parties to exercise calm and restraint and avoid any move that may escalate tension. The pressing concern for now is to conduct a comprehensive, fair and objective investigation on the suspected chemical weapons attack in Syria to find out the truth. We have noted that the Organization for the Prohibition of Chemical Weapons will send experts for investigation on the ground. Q: It is reported that while meeting with Philippine President Rodrigo Duterte on April 10, President Xi Jinping said that the two sides should continue to properly handle the South China Sea issue, and discuss joint exploration, development and cooperation at an appropriate time, thus making the waters a sea of cooperation and friendship. President Duterte also said that the Philippines will work with China to maintain peace and stability in the South China Sea and boost cooperation in this regard. What is your expectation for such bilateral cooperation in the South China Sea? A: China remains committed to peacefully resolving the South China Sea dispute with parties directly concerned through negotiation and consultation. Pending final settlement, China would like to conduct practical cooperation in various fields with parties concerned, including under the principle of shelving differences and seeking joint development. Joint development will not affect the legal position of either side on the relevant issue. Thanks to the joint efforts of the two sides, China and the Philippines have seen a sound and steady development of bilateral ties and a smooth running of practical cooperation in various fields. Yesterday, the two leaders held another successful meeting and made the strategic decision on continuing to properly handle the South China Sea issue and move forward maritime cooperation. For the benefit of the two countries and peoples, China stands ready to work with the Philippines to implement the important consensus reached between the two leaders, jointly conduct and deepen practical cooperation in the South China Sea, and seek an early realization of joint exploration and development. Q: What topics will come up in State Councilor and Foreign Minister Wang Yi's discussions with the Japanese side this time? What is China's expectation for the outcomes of this visit? A: As I said, State Councilor and Foreign Minister Wang Yi's official visit to Japan this time makes an important move for the two countries to step up high-level exchange and communication. We hope this visit will strengthen mutual trust, build consensus and manage differences between the two sides, thus further consolidating the momentum of improving China-Japan relations. In addition, State Councilor and Foreign Minister Wang Yi will also co-chair the 4th China-Japan High-Level Economic Dialogue with Japanese Foreign Minister Taro Kono. Q: According to reports, a senior Australian official said yesterday that they would view with great concern the establishment of any foreign military base in Pacific Island countries and their neighbours, and China seems more engaged in the Pacific region. What's your comment? A: Such allegation of the Australian side is sheer fiction, and Vanuatu has clarified on this matter. I would like to point out that the practical cooperation between China and South Pacific island countries in various fields has effectively promoted local socioeconomic development and been warmly welcomed by local governments and people. The South Pacific island countries should not be the sphere of influence of any country. Enough with certain Australian individuals' interference in other's internal affairs. It would be better if they can make concrete contributions to those countries' development rather than stir up troubles. Q: Why did China abstain from voting on rather than veto the resolution proposed by the US concerning the Syrian issue at the Security Council yesterday? Given the increasingly tense situation in Syria, military operation may become an option. What is China's attitude on this matter? A: As I said, Ambassador Wu Haitao, Deputy Permanent Representative of China to the UN, already made an explanatory statement to explain China's position in a comprehensive, thorough and clear manner when the Security Council took actions on relevant draft resolutions. You may refer to that. As to the latest development of the situation in Syria as mentioned, including possible military strike, I already made clear China's position yesterday. We always believe that political settlement is the only viable way out and military means will lead to nowhere. 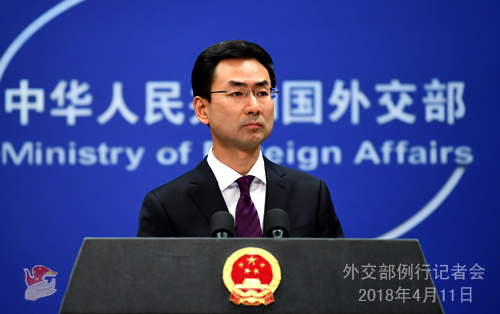 China always stands for peaceful settlement of disputes, opposes wanton use or threat of use of force in international relations and acts in accordance with the UN Charter. 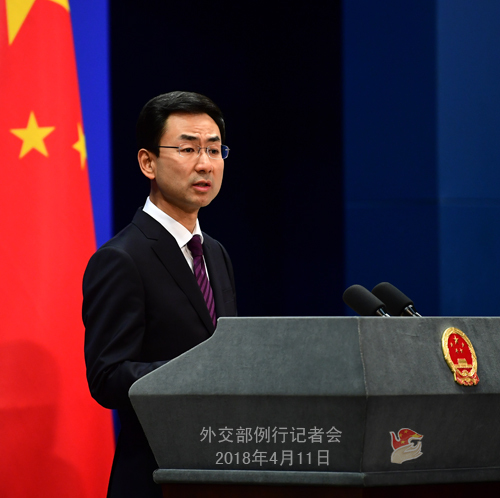 China is willing to work with parties in support of the mediation by the UN to ease the tension in Syria and promote the political settlement of the Syrian issue at an early date. Q: The Spokesperson of the US White House said on April 10 that the US is encouraged by President Xi Jinping's words and wants to see concrete actions from China, and the US is going to continue moving forward its tariff measures until those happen. How do you respond? A: By announcing these new major opening-up initiatives, China demonstrates its commitment to promoting trade and investment liberalization and facilitation, forging an open global economy, and seeking win-win cooperation with other countries. We also made clear our opposition to unilateralism and trade protectionism. We believe that companies and people of all countries, not just in China, stand to benefit from our new measures. The international community responded to these measures with positive remarks. At the luncheon held after the opening ceremony, leaders of many foreign states and international organizations said that China's attitude is quite clear, and now it is up to the US to respond. We hope that the US could carefully assess the situation and make the right choice. As for what you asked about the US proceeding with its imposition of tariffs, I would like to reiterate that if the US takes further actions to undermine China's interests, we will fight back forcibly. There is no doubt about that. We never just talk the talk.